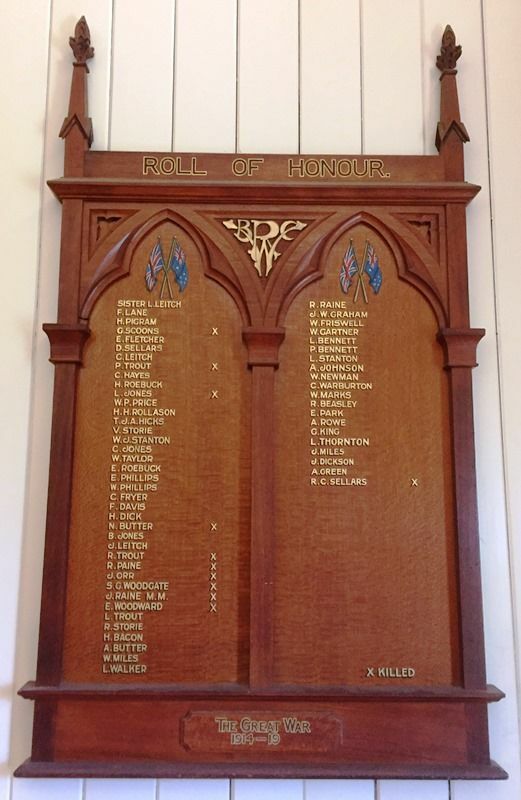 The unveiling of the honour board of Windsor road Baptist Church took place on Tuesday evening. Colonel Sutton, C.R.,C.M.G., in the company of relatives and friends of the lads who had gone from the church, performed the ceremony. Captain C. E. S. Fryer occupied the chair, and with him on the platform were Colonel and Mrs. Sutton, Rev. T. McColl and Mr. G. Trout. An apology was received from Rev. T. Leitch, the pastor of the church, who was unwell. Colonel Sutton, who was received with hearty applause, said he appreciated the honour done him by the request to unveil the board. He paid a special tribute to the good work that our brave Australians have done, and are still doing, for the Empire. He had seen the horrors of war in many different phases, and nothing too much could be done for the men who were thus fighting for the protection of our homes. As the screen, composed of a Union Jack and the Australian flag was drawn aside, exposing the honour board, the audience rose and sang the National Anthem, including the verse beginning "Australia's Sons Uphold." Mr. Trout congratulated the church on the beautiful board, and offered a word of praise to those whose names appeared on it and a word of sympathy to the bereaved ones. Mr. E. R. Beasley moved a vote of thanks to Colonel Sutton, and it was seconded by Ald. Hayward. Colonel Sutton replied, and stated that his two boys were also in France doing their bit. The board contains 56 names (including that of one nurse), 10 of whom have made the supreme sacrifice. Telegraph (Brisbane), 23 August 1918.